One New Aftermarket Replacement Radiator Core (with TWO Gaskets) made to fit John Deere Tractor models: 50, 520, 530. Replaces Part Numbers: AB4666R x 1 (Radiator), & GK2418 x 2 (Gaskets). 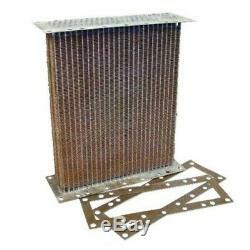 The item "AB4666R Radiator Core with Gaskets Made To Fit John Deere Tractor 50 520 530" is in sale since Tuesday, November 27, 2018. This item is in the category "Business & Industrial\Heavy Equipment, Parts & Attachments\Heavy Equipment Parts & Accessories\Antique & Vintage Equipment Parts". The seller is "reliableaftermarketpartsinc" and is located in Williamston, Michigan.